There are many different types of animals that survive in the rainforest. Many are endangered or near extinction. It is a huge animal found in Africa. There are two types of elephants. They are the African Savanna Elephant and the Asian Elephant. Today only about 500,000 elephants remain. One third of that population are forest elephants. The Bengal tiger lives in the regions of India, Bangladesh, China, Siberia, and Indonesia. The Bengal tiger is a carnivore. It eats wild oxen, boars, monkeys, and other animals. It helps balance the web by eating wild oxen and other animals, which eat plants. The eyes, bones, and whiskers of the tiger are quite valuable to researchers that are making medicine to cure human ailment and give people longer life. Chimpanzees will move around their territory, never staying long in one place. They are about 3 to 5 feet tall and weigh from about 99 to 176 pounds. There are somewhat 35,000 chimps in the wild, but destruction of their habitats, commercial trapping for the animal trade, and hunting has caused the population to reduce. The Golden Lion Tamarin is a small mammal that lives in tropical rainforests in eastern Brazil. They can grow to be 12-15 inches long from head to tail. 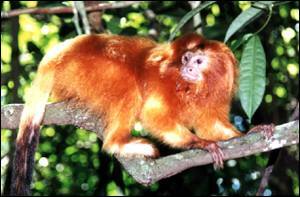 Golden Lion Tamarin eats insects, fruits, small snakes, lizards, snails, spiders, and vegetables in order to survive.